“It is a magical and revolutionary device at an unbelievable price,” said Steve Jobs unveiling Apple’s “latest creation” yesterday in San Francisco. Although we may doubt if the iPad really brings “magic” and “revolution” to us, we have to admit the prices are unexpectedly low. Yesterday, Apple’s stocks started to climb fast only when Jobs revealed how much we’ll have to spend on the device. All the rumors were saying the tablet will be not less than $999, and from this point of view the actual prices look really affordable. $499 for the basic version (16GB, no 3G) is something nobody expected; also $829 for the bloated 64GB, 3G version won’t scare anyone. So, what do you get for this price? 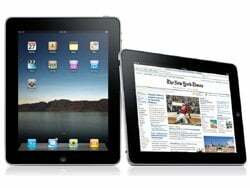 iPad is 0.5 inch thick, 1.5 pound device with 9.7-inch, 1024 x 768, LED-backlit, responsive high-resolution Multi-Touch display that features IPS technology and has a wide 178 degree viewing angle. It’s powered by 1GHz “A4” chip designed by Apple (using their own P.A. Semi technology) and is claimed to have 10-hour battery life and a month of standby. It’ll come with a 30-pin dock connector, a microphone, a speaker, Bluetooth (2.1 + EDR), 802.11n WiFi and optional 3G, as well as an accelerometer and a compass. iPad comes in two versions—one with Wi-Fi and the other with both Wi-Fi and 3G. iPad includes the latest 802.11n Wi-Fi, and the 3G versions support speeds up to 7.2 Mbps on HSDPA networks. Every iPad is unlocked and comes with a GSM micro-SIM. Together with AT&T, Apple announced 3G pre-paid data plans for iPad: 250MB for $14.99 and an unlimited plan for $29.99 a month contract-free (with on-device activation and management, and a free use of AT&T WiFi hotspots). International deals will come in June. iPad syncs with iTunes just like the iPhone and iPod touch, using the standard Apple 30-pin to USB cable. The device features 12 Multi-Touch applications. Every app works in both portrait and landscape, automatically animating between views as the user rotates iPad in any direction. 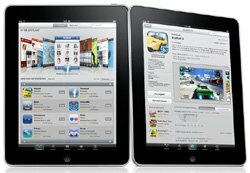 The operating system is based on iPhone OS, so the iPad can run all iPhone apps – either pixel-for-pixel in a window, or pixel-doubled fullscreen. Apple says they rewrote all of our apps for this display. Apple released a new SDK for iPad, allowing developers to target iPad’s specifics while developing new apps. The SDK includes a simulator that lets developers test and debug their iPad apps on a Mac, and also lets developers create Universal Applications that run on iPad, iPhone and iPod touch. 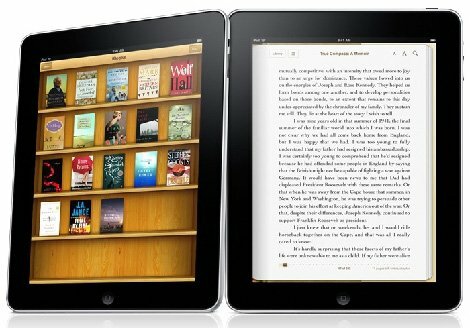 Apple also announced the new iBooks app for iPad, which includes Apple’s new iBookstore that will feature books from “major and independent publishers”– five new big Apple’s partners: Penguin, Simon & Schuster, Hachette Book Group, Macmillian and Harper Collins. iPad has almost full-size soft keyboard but it also connects to the new iPad Keyboard Dock with a full-size traditional keyboard ($70). Additionally, there is a "camera connection kit" to allow to plug a camera in over USB or use an SD card ($30) and a leather case ($40). Unfortunately, iPad doesn’t support Adobe Flash and multitasking. There is also no camera and HDMI output. New Apple device will be available in late March worldwide for a suggested retail price of $499 for the 16GB model, $599 for 32GB and $699 for 64GB. The Wi-Fi + 3G models of iPad will be available in April in the US and selected countries for a suggested retail price of $629 for the 16GB model, $729 for the 32GB and $829 for the 64GB.